If your wife has been breastfeeding for the past several months, you can bet she is ready to switch over to feeding your new baby solid foods. However, this transition requires delicacy in order to make sure your little one doesn't incur any health problems. Start too soon, and you may find your child has difficulty chewing and swallowing whole foods, while waiting too long could lead to fussy eating habits and even serious allergies. 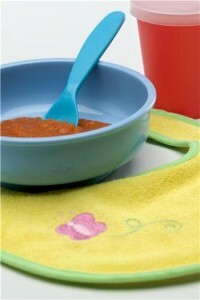 The ideal age to begin feeding a child solid foods is between 4 and 6 months old. Up until this point, it's best to stick to a strict milk diet – either breast feeding or formula. While you might be hesitant to start your little one on solid foods, waiting too long can greatly increase the risk of developing allergic sensitization to food as well as airborne allergens. In particular, children developed sensitivities to eggs, wheat and oats, while fish and potatoes were found to be related to the development of airborne allergies. Even worse, babies with high food sensitivities are at greater risk of developing type 1 diabetes. So what solid foods should you start your children with? Introducing a wide vareity of fruits, veggies, grains and protein is essential for developing an eclectic pallet – with the exception of honey, undercooked meat and unpasteruized cheese. There should be at least one green food in every meal, but the process is less about servings and more about food exploration.